Parking permits are required only 5 days a week now in the 16th Avenue Visitor Parking Lot. No permits needed on weekends and evenings. However, all faculty parking lots will continue to need permits. When you need a permit, just contact us and we will mail or email a dated permit to you. ordering books that our gallery photographer, Gary Miller, has put together of Larson Gallery exhibitions and events. ART Window Clings now available for $5. Popular in car windows -- a great way to support and promote the Larson Gallery. Check our gift corner for ever-changing artworks from local artists. On “Reflecting Sunlight” by Kathryn Kaye, Mattie says, “I like this piece a lot. The reason I like it is because it looks very sad. Then I saw the title “Reflecting Sunlight". It’s sad, but it seems like there’s hope. The Summer Fun Workshops Series is packed full of non-stop creativity! Each weekend in July the gallery is excited bringing you new mediums to express the artist within. Whether you’re a beginner eager to learn something new or a seasoned aficionado these workshops are sure to bring new experiences and ideas to the table. With instructors like YVC art teacher, Meghan Flynn, and former Larson Gallery Director, Carol Hassen, you’re bound to walk away with a treasure trove of information and inspiration. Register online at larsongallery.org. Hurry seating is limited! The Yakima Fiber Art Group is presenting a group Fiber Arts Exhibition hosted by Yakima Maker Space Gallery in the month of June. All fiber Arts will be considered: weaving, fabric collage, knitting, crochet, quilts, felting, applique, embroidery, textile sculpture or mixed media including fiber. This is an open call to the Pacific Northwest Fiber Arts community with a focus on Central Washington. YMS gallery has been hosting art exhibitions for the last two years in our 800 sq. 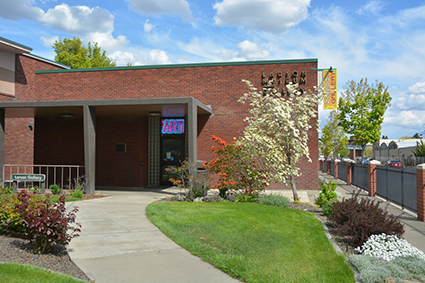 ft. high ceiling exhibition space located in the heart of downtown Yakima adjacent to our 5000 sq. ft. Maker Space. Selected artists will be proudly displayed for the entire month of June with a public artist reception scheduled for June 15th from 6 p.m. to 9 p.m.
A June group exhibition at BOXX Gallery in Tieton will feature work by Karen Quint (drawings), Kerry Quint (sculptures), Jackie Prout (fabric), Rob Prout (photographs), Jane Gutting (ceramics) and Terry Martin (poetry) —six area artists who also happen to be couples. A number of pieces in the show involve mixed-media collaborations between pairs of artists, many incorporating both text and image. View the Iliad, Odyssey, and more. Open Saturdays 11 am - 3 pm and by appointment through July 28.